Hospitality suite: Low with a model of the Tribeca tower project. If a serviced apartment is like a marriage between a hotel and an apartment, Low Yat Group's latest luxury project may elevate the romance between the two to another level. Named after a neighbourhood in Lower Manhattan of New York City, Tribeca is designed with elements of a neighbourhood within a building that is also equipped for hotel-style living. Executive director Low Su-Ming says Tribeca will target mainly investors as well as those seeking the true essence of city-living. “We find property investors these days seek a lot more added value for their investments,” she tells StarBizWeek. Among the key features of the hospitality suites are the two rooftop infinity swimming pools and five distinctively different Sky Pods which work as common areas scatter throughout the building. This is a concept first in Malaysian residential developments and will be visible from the exterior of the building. The pods, or breakout spaces, will each occupy three storeys along the corridor with internal staircases for easy accessibility. Among the pods would be a jungle-themed children play pod, a three-storey exclusive club lounge, business function rooms and more. “Each pod acts as extended features to the units where residents or business travellers staying temporarily can entertain friends in one of the lounges or host a 20-pax dinner function in the club,” she says, adding that while residents are free to utilise the common facilities, “some are only accessible with a small fee”. Tribeca is also designed to light up with colours all around its tower. “We say for this project, we say we have to do a bit different to define urban. It does not have to be the gray, CBD, Class-A steely look,” Low says. The group wanted to bring a bit more fun and life into the cityscape by featuring different coloured windows at each unit, making the whole tower rather colourful from the outside. “As a private developer, we are doing our fair share in contributing in terms of not just adding another building to the city skyline but also thinking of ways to activate the city,” she says. Being sited on a very strategic location, Low says the group wants to complement the activities already there while further adding vibrancy to the city centre by designing and operating a building that meant for urban lifestyle. The development will have 297 units built on a 0.756-acre freehold land. It is a 15-minute walk to Kuala Lumpur City Centre through the covered walkways and a five-minute walk away from Pavilion shopping mall. Situated in on Jalan Imbi, it is close to the Bukit Bintang and Imbi monorail stations. It will also be accessible via the proposed My Rapid Transit stations in the Bukit Bintang and Pasar Rakyat. For the studio and suites in Tribeca ranging from 510 sq ft to 1,020 sq ft build-ups, Low Yat expects to price them between RM950,000 and RM1.5mil. The development has limited loft units with a build-up of 1,300 sq ft, priced in the range of RM2.4mil to RM3mil. The 36-storey development is targeted to launch in the last quarter of this year and construction would be completed three years from then. “Summing it up, it's a solid and sustainable investment project. Small units are selling better than larger units, that is a fact,” Low says, adding that while 10% of the units were lofts, the focus is on small serviced suites. Although land bank in the bustling city centre may be a challenge, Low continues to see potential in Greater KL. “The Low Yat Group has been a part of the metamorphosis of Greater KL over the last 60 years beginning with its first development Federal Hotel in Bukit Bintang,” she says. She reveals that there are expansion plans underway for some of Low Yat's first developments in the Golden Triangle, such as Low Yat Plaza and BB Park. Under Low Yat's property development division are two distinctive portfolios, namely the premium luxury portfolio and the ongoing affordable and mid-market housing developments. 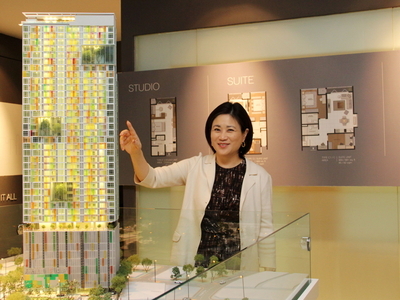 “Tribeca would be the latest addition to our premium luxury projects that occupy prime city centre sites while we are also undertaking larger land tracks for residential landed development happening in the northern Klang corridor,” she says. With the rampant developments around the Klang Valley, Low says that there is a whole basket full of options for Malaysians in different parts of Kuala Lumpur. “Different town centres are sprouting out all over Klang Valley but there is only one city centre and it continues to be appealing to both locals and foreigners,” she says. For its luxury developments, Low Yat has completed and on-going projects like Bintang Fairlane Residences, MyHabitat serviced apartments and the Shiki ski resort in Niseko, Japan. Low Yat Group has also expanded to China with a commercial development project in Changsu.